In the 1950s, your bass guitar options were simple: the Fender Precision bass. Things have gotten far more diverse and complex since then, and it can be challenging to know what to buy. Whether you're buying your first bass guitar or upgrading to something better, the following guide will help you navigate the process in a methodical, fruitful way. Search a large online retailer and pay special attention to the pricing parameters that show model bass guitars are sold in different price ranges. At Guitar Center, for example, it usually has the highest concentration of new bass models selling in the $500 to $750 range. They sell a small number in the $100 to $200 range. They sell a fair amount of high end bass guitars that are multiple thousands of dollars. You will find a similar pattern at other retailers. Determine the price range that will best suit your budget and needs. Here are some general ranges based on your playing level to help you get a feel for what it will cost. A quality beginner's bass, such as Squier or Dean, will be about $100 to $300 depending on how nice of a beginner's bass you want. If you buy used, it's even possible to get a beginner's bass for under $100 in some cases. An intermediate player will have a clearer idea of what they need in a bass guitar, and they will want to buy their first high quality instrument. In this range, the basic models of world-class brands become available, such as a base model Schecter Stiletto or an authentic Fender '50s-style Precision bass. It's always an exciting moment when a bassist has graduated from the beginner's Squier model, a Fender lookalike, and moved on to a real Fender Precision, the bass that started it all at the dawn of rock and roll. When you start moving north of $2,000, you're getting into custom bass territory where you can afford to pay a custom shop to make a one-of-a-kind bass exact to you're specifications. Once you've become a working professional, you will likely have the budget and know-how to dream up your own bass guitar design. To be sure, $2,000 is more like the bare minimum for a custom made bass guitar, which depends on which custom shop you hire and how fancy you want to get. Bass guitars are made primarily of wood in their bodies, necks, and headstocks. Much can be said about the science of tone woods and how different wood materials change the sound. Here is a general breakdown of the tone wood categories. Any genre that needs an energetic, bright-sounding bass will find a friend in hardwood bass guitars, though, again, much of this is subjectively determined by a bass guitarist's taste, playing style, and amp/pedal configuration. When you're shopping for a guitar, simply check the product specs and see what kind of woods were used to make the bass guitar. Depending on what kind of sound you want, you can look for a bass guitar that has a body with a hard or soft wood. Believe it or not, manufacturers build bass guitars with many more strings than just the standard four. The additional strings are either lower notes below the standard low E string that give the bassist powerful, rumbling note options, or they are higher notes above the standard G that give the bassist more trebly tone colors to add to her riffs and soaring bass solos. 4-String - E, A, D, G. This is the standard, most common configuration you'll find in every genre of music. 5-string -B, E, A, D, G. This string-setup is popular in the metal genre because it adds heavy bottom (the low B) to the bassist's toolkit. However, the lower string is also a helpful tone option for other genres that emphasize big bass frequencies such as EDM and hip-hop. 6-string - B, E, A, D, G, C. Having both an extra low string (low B) and an extra high string (high C) is popular among jazz bassists or bassists who are more advanced in their skills and want more range for their scales, chord fingerings, and melodic sequences. Progressive metal or instrumental rock bassists tend to gravitate toward these multi-string instruments. 7-string - B, E, A, D, G, C, F. At this point, the bassist has such a wide range of extra strings (low B, high C, high F) that she can play multiple roles in the band, even playing lead guitar-sounding runs. More complex genres, such as jazz or virtuosic metal or highly complex funk bands, tend to enjoy the many options that a 7-string provides. Many bassists ask, "Why on earth would you need all those strings?" It all depends on your needs and vision for your bass sound. Granted, most bassists who use the deep rumbling B-string, for example, are in the metal genre. But depending on what type of music your band is arranging, having a huge range of note options at your disposal can be helpful. Acoustic basses are exactly what you'd expect: they do not plug into anything. They project loud enough to be easily heard in a small space just as an unplugged acoustic guitar can be heard without a problem in a small space. Students in college dormitories, for example, love acoustic basses because they're so convenient to use for practice time without being too loud with an amp or having to use headphones. Acoustic basses are helpful if you need a convenient instrument that you can take anywhere to practice without needing amps or cables. They tend to have a jazzier, organic sound perfect for small ensembles and venues. Electric basses have a boomier, thumpier sound that lends itself better to louder genres and show spaces. Electric basses require more money and effort to use because you need cables, amps, pedals, and cases and transport for all those things. Your circumstances will dictate which kind of bass guitar you need. You simply need to get a clear idea of where you intend to use your bass guitar and with whom and in what genre, and that should tell you all you need to know. Of course, in the world of music rules are meant to be broken. There will always be exceptions to the categories above, but it provides a general reference point for determining which kind of bass fits your needs. A standard four-string bass with hardwood works for the harder genres like rock or loud souther country or genres that need a lot of punch and slap such as funk or hip hop. A soft wood electric four string bass with warmer tones and bigger resonance might be preferred in mellower genres that are amplified such as country ballads, relaxed R & B, or soft rock and pop. An acoustic bass is often used in jazz. A five-string (or more) bass is often used in metal to get a lower, rumbling bottom end. Rules are made to be broken and in today's music industry, the genres intermingle and cross-pollinate more than ever. For this reason, it's more about your specific band and what you're trying to accomplish that will determine what kind of bass sound you need. Fender: They will always be at the top of the pack because they started the electric bass guitar craze in the '50s. Their instruments are always world-class, though usually pricey. Squier: This is Fender's more affordable version of their premier basses. Squier is great especially if you're on a budget and just starting out. Ibanez: Ibanez bass guitars, made by a Japanese company, are popular among metal bassists, but they have also (surprisingly) gained an adoring following among jazz bassists. Rickenbacker: These bass guitars were used by legends such as The Beatles. They are expensive, but they produce a gorgeous, rich, punchy yet warm tone profile is worth the money if you can afford it. Washburn: This company has been around since the 1800s. Today, they've become especially respected for their affordable yet good quality bass guitars. These are great for beginners. Warwick: These bass guitars are the Rolls Royce of bass world. Their Corvette, Streamer, and Thumb models use hard-to-find exotic woods and exquisite finishes. This makes them some of the most expensive bass guitars on the market, but if you're on the hunt for something high end, Warwick is a must-try before you make a final decision. Yamaha: This well known audio gear company has superb basses across the gamut of budgets. Its RBX170 is an affordable but very nice sounding bass for musicians on a low budget or just starting out on the bass. On the other hand, their TRBX line is a stellar high end bass that holds its ground with any other expensive bass guitar used by advanced players. Lakland: This is a new bass guitar company ("new" in the relative sense, contrasted to the other companies), based in America, and they've quickly built a reputation for their high-end bass guitars. They are often compared to the world-class sound of Fender. Schecter: Their custom-styled bass guitar lines, especially the Stiletto line, have become highly sought after for their superb craft, amazing tone and gorgeous look. They are on the higher end, but like the Rickenbacker they're worth every penny. Gibson: This iconic brand is often overlooked in the bass category, but Gibson is known at least for its famous Thunderbird bass guitar, which was made famous by Nikki Sixx of Motley Crue. Spector: Another relatively new American company, Spector basses have built a reputation for having very warm, earthy sounding basses. If you're looking for something on the mellower side, you may want to look into Spector. They make a variety of models that range from budget-friendly to high end. Music Man: This unique bass guitar maker has their well-known StingRay model and their lesser known Sabre, Bongo, and Sterling models. They're known for the unusual choice of having fat humbuckers instead of single-coil pickups, and their designs can be wild and interesting. They're unique and consistently sound fantastic. It's not enough to read about a brand. 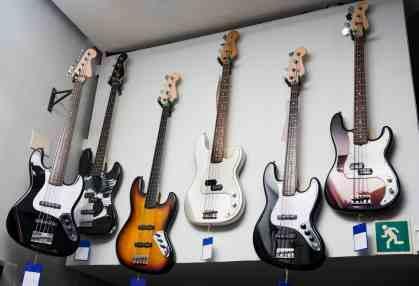 You need to go to a shop and play one of their bass guitars and see how your ears and fingers feel about each brand. Finding a brand you like can be a very personal, subjective experience. One person's trash brand is often another person's treasure. The wide selection of bass guitar options can be a blessing and a curse. Trying to narrow down on a single bass guitar can be hard. Nothing is perfect, of course, but if you do diligent research and take your time with the process, you can come home with a superb instrument that will last you years if not a lifetime.